Loot Crate and Nerd Block are two very big subscription box companies. They both have a large fan base and they both consistently give out awesome product in their boxes. Loot Crate costs $13.37 a month plus shipping which comes out to be around $20 a month. Meanwhile, Nerd Block costs $20 a month but, since it ships from Canada, costs close to $30 after shipping. Regardless of which one you get, the items in the boxes will always add up to more than what you paid for the box. And it’s a great way to collect nerdy t-shirts. Loot Crate includes a t-shirt in a few of their boxes each year and Nerd Block includes a shirt in every box which probably explains the added monthly cost. This month, I decided to get both of them so I could compare them. Here’s what I got and here’s what I thought! Loot Crate’s theme this month is Titan. 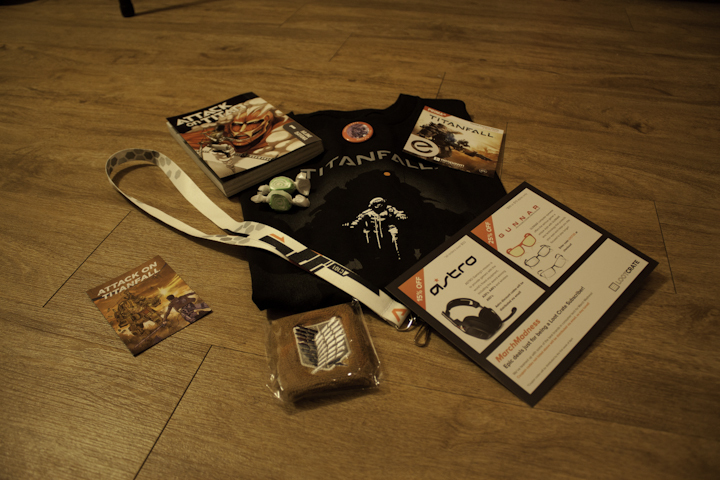 They included an exclusive Titanfall developer t-shirt, lanyard, Attack on Titan Vol. 1 manga, Attack on “Titanfall” magnet, Attack on Titan Scout Regiment wrist sweatband, an e-book code for a Titanfall strategy guide, some taffy candy, a button, and some coupons. Overall, a very solid box and great items. The t-shirt is unique and apparently you can’t get it in online stores. I mean, you can get it off e-bay now because people are selling them from their crate but it’s otherwise exclusive to the box. The lanyard is snazzy looking, the manga I can’t wait to read, I’ll use the sweatband when I exercise, and if I ever get an Xbone I’ll read the strategy guide. This crate was better than last month’s Warriors themed one. This was my very first Nerd Block because I missed the deadline for last month’s. Anyway, this month Nerd Block said they teamed up with Ubisoft for a special item in the box. Therese, Sam, and I thought it would have something to do with Assassin’s Creed or perhaps Watch Dogs. We were right. Nerd Block’s special item from Ubisoft was an Assassin’s Creed action figure toy. I might leave it in the packaging or take it out and display it on my desk. 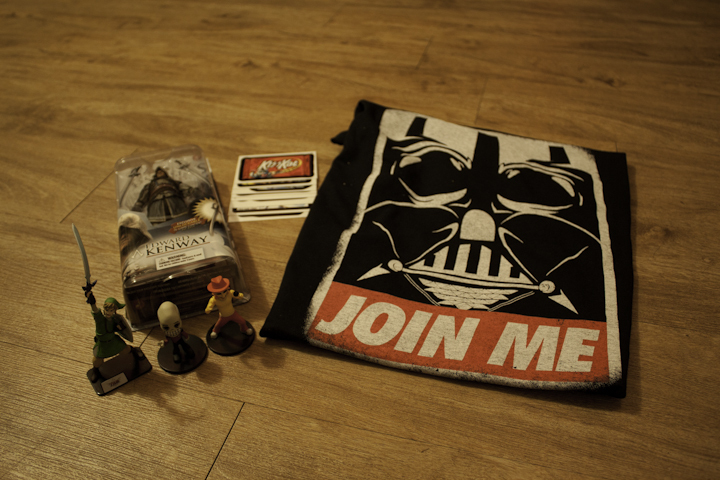 The other items in the box consisted of 3 different figurines (Legend of Zelda, Simpsons, and Star Trek), a hilarious pack of stickers, and a Darth Vader t-shirt. All the figures are just going to be desk ornaments because I don’t really collect them but they’re fun to look at. The stickers I’ll find someplace to put them, perhaps some on my bike and one on my snowboard. I am currently wearing the t-shirt right now and it’s probably my favorite item from the box. Not bad for my first Nerd Block! To put one ahead of the other you really have to look at how much effort goes into each box. I think Loot Crate puts more effort into their boxes because they always have a central theme with all the items revolving around that theme. It makes the box feel more…together. You also have bathroom reading material because it comes with a little mini-magazine for you to read about all the stuff you got. Plus it’s $10 cheaper. Nice review. Your Zelda themed action figure is Link himself, not Zelda. Yeah….I screwed the pooch on that one. I made some annotations on the youtube video, dont know if they showed up or not. ¡¿”Zelda himself”?! I face-palmed so hard that my Titan went supercritical and the entire Survey Corps were wiped out. Titanfall is not an Xbox One exclusive either; it’s also available on PC. Thanks for this post. It is very informative and helpful. Although, you may need your nerd card revoked for confusing Link for Zelda. I’m sure you’re beating yourself up enough over that one. Great video and review! Thanks! You seemed overly optimistic about loot crate imo, don’t own Titanfall and happy to receive a digital copy of a guide, yeah awesome… Also, you wrote Loot Crate cost on the cost of the Nerd Block, and I would like to know if you included the shipping cost of the boxes in the total price, because I can’t get Loot Crate in Sweden so I can’t even get it. I would say personally I would prefer Nerd Block myself as I prefer figurines way more than apparel and things on papers. But I’m still finding out what actually is in Nerd Block most of the time. Loot Crate seems a bit more affordable, to bad I can’t get it if I wanted.